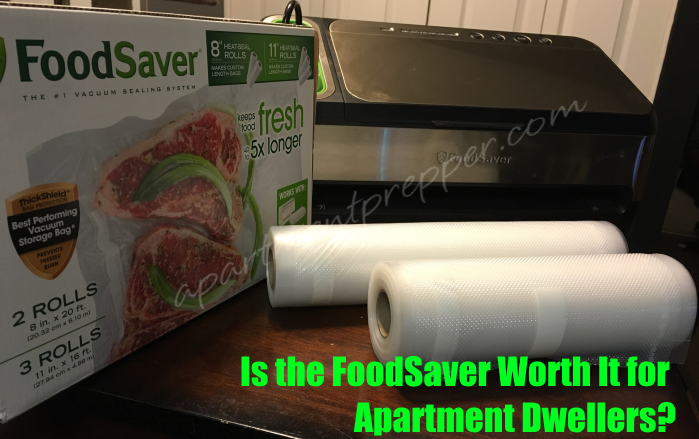 HomeEmergency PreparednessIs the Food Saver Worth It for Apartment Dwellers? Is the Food Saver Worth It for Apartment Dwellers? Avoiding food waste is one of our goals in our household and it is always a challenge. At the same time, living in a small space makes me evaluate whether an item or gadget is worthwhile to have while using up precious counter space. When Apt Prepper Daughter got a FoodSaver for Christmas, I was excited for her to try it. 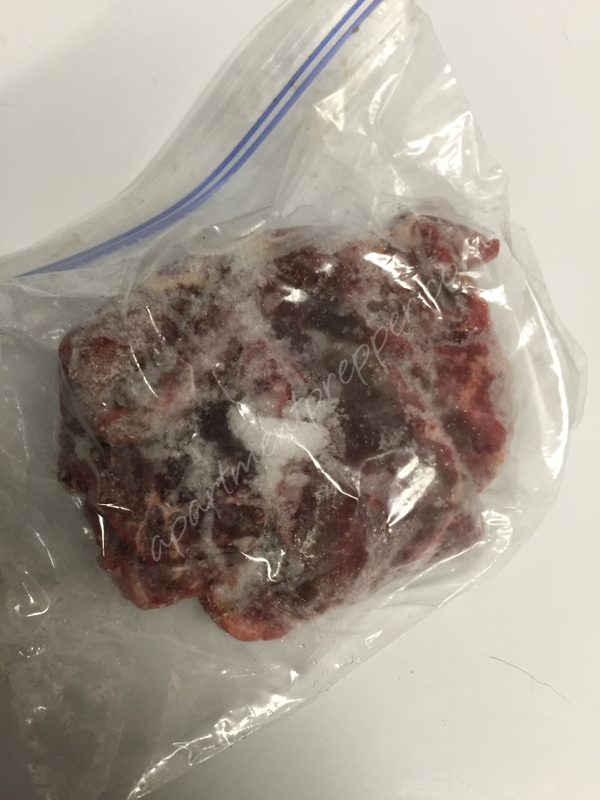 She did the most basic test to see whether meat frozen in a FoodSaver pack would last longer than meat that was frozen in a zip lock bag. The meat tested was fresh ground beef. One half was stored in a zip lock bag, and the other half was stored in a FoodSaver vacuum sealed package. Both packages were stored side by side in the freezer section of the apartment refrigerator. You can tell there is a big difference. The meat that was vacuum sealed had no freezer burn at all, while the other one had a lot of freezer burn. In terms of making your frozen foods last longer, the FoodSaver delivered. When I think about how much money we have wasted from throwing out freezer burned foods over the years, I wish we had used one sooner. What about using the FoodSaver for long term food storage? I personally have not tried packaging food for long term storage in the FoodSaver, but one of my trusted bloggers, Gaye over at Backdoor Survival has written all about it. If the FoodSaver can help me prevent waste AND help me with long term food storage, then I am in favor of having one. 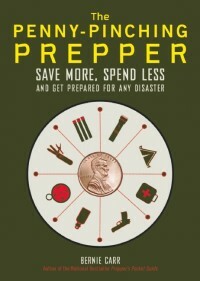 Although I have had some reservations about having a FoodSaver unit taking up counter space, I can see how the benefits of having one for everyday purposes as well as preparedness uses. 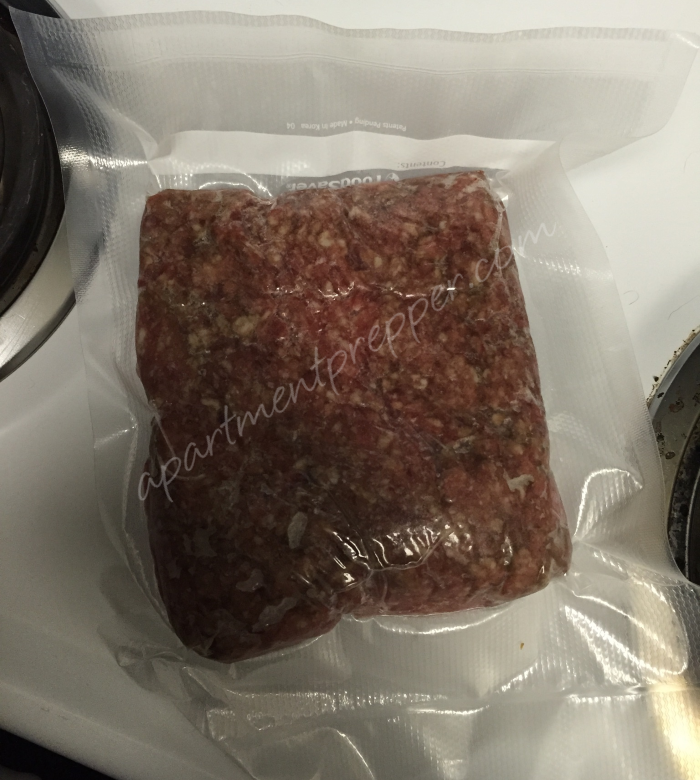 4 Comments on Is the Food Saver Worth It for Apartment Dwellers? I live in an apartment and love my food saver. As you discovered,less waste from freezer burn and slso i save money by getting larger quantities and freezing it in smaller portions. Got the attachment for sealing in jars and use that alot too. As for storing it…..mine fits nicely on the top shelf of my shoe rack in my bedroom closet! Hi Sandy, That’s great- it saves $ and hardly takes up much space. Thanks for sharing your experience! I love my Food Saver. One other thing it is very useful for is resealing plastic bags from the store. For example, potato chips, frozen veggies and other frozen foods, and anything with a plastic bag that can be resealed using the instant seal feature. You would not want to vacuum chips because it will crush them. It keeps my family from wasting tons of chips. It also keeps the frozen things fresh without using a vacuum seal bag which can get expensive. Also try this: I store powdered milk in vacuum seal bags. You can put the envelope in the bag an vacuum it or buy bulk powdered milk and measure it out in portions and vacuum seal it. It works great for oatmeal, rice and other dry goods. Just remember that in an end of the word situation, you want to store things where rodents can’t chew threw the vacuum seal bags. I like to store things in a chest or popcorn tin with tight lid. One other awesome thing – you can pull the cardboard tube out of toilet paper and flatten the paper, then vacuum seal. You can store this long term in the car for emergencies and the times the state park hasn’t restocked LOL. 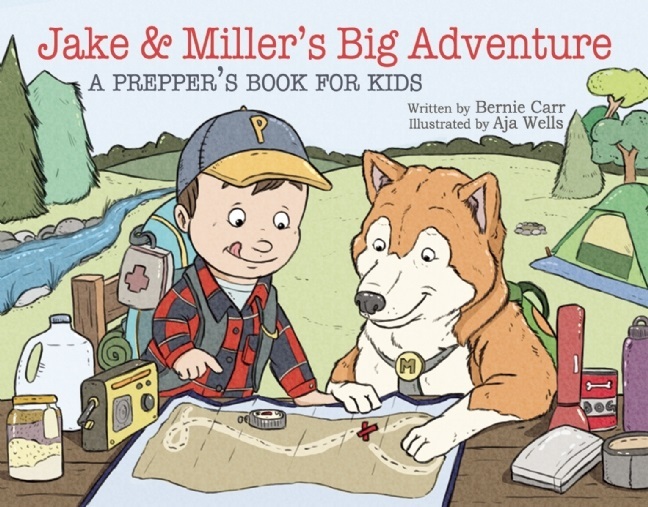 Hi GA Girl, You are right, have to store vacuum sealed bags inside a 5-gallon bucket or tin that is rodent proof. Had not thought about using the Food Saver vacuum sealer to store flattened toilet paper-great idea! Thanks for sharing.